The Center for Autism and Related Disabilities at the University of South Florida (CARD-USF) and their innovative project, the Autism Friendly Business Initiative, was nominated for the Joe Sanchez, Jr. Leadership Award at the 2018 Mayor's Alliance for Persons with Disabilities Award Luncheon. The award recognizes outstanding achievement in the increase of integration of people with disabilities into public and private programs, services, events and facilities. The City of Tampa and CARD-USF joined forces on the Autism Friendly Business initiative in 2017 to create a more welcoming and sensory friendly experience for people of all abilities. CARD-USF has provided training and technical assistance to various departments within the City of Tampa during 2018. 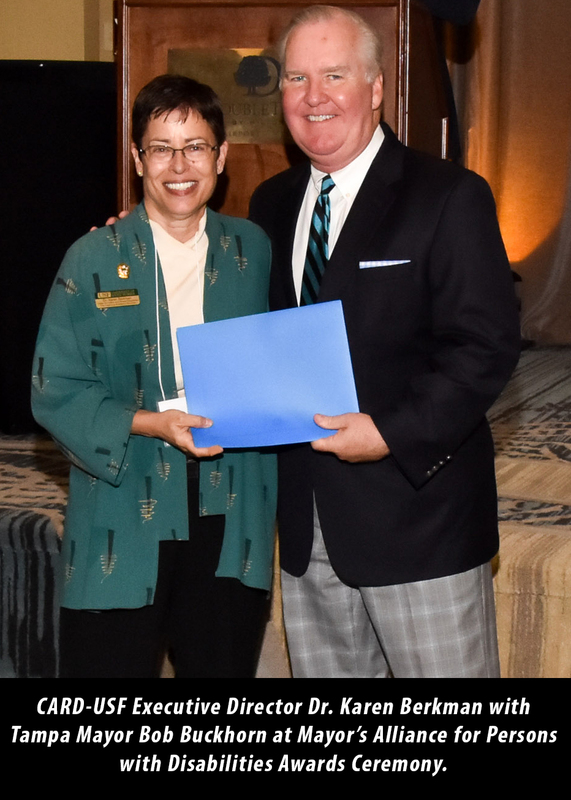 CARD-USF Consultant, Denise Barnes, was also nominated for the Excellence in Media: Outstanding achievement in the initiation or implementation of media which recruits, hires, promotes and/or accommodates employees with disabilities. Congratulations to CARD-USF, Dr. Karen Berkman and Denise Barnes!